We decided to do a single affiliation week this time around. We ruled that included anything that had the icon for your chosen affiliation OR referenced said affiliation in its card text. So while my affiliation was officially Green Lanterns, I included three Blue Lanterns in my build. And when mixing colors, green and blue combine to make cyan. One unusual thing about the Green Lantern affiliation: it’s on action dice. Specifically, Lantern Ring (Common and Rare) and Lantern Battery (Common). So I went with Rare Lantern Ring and Common Lantern Battery. Rare Lantern Ring was a meta card before it rotated out, and is still a strong win con in Golden. Lantern Battery was on the team because it would be difficult for my opponent to remove. That’s because I was intending to use as the workhorse character of my team. If I have either Lantern Ring or Lantern Battery in my field he gets +2/+2. If I have both of them, I just need two Green Lantern characters to get Kyle’s buff to +5/+5. 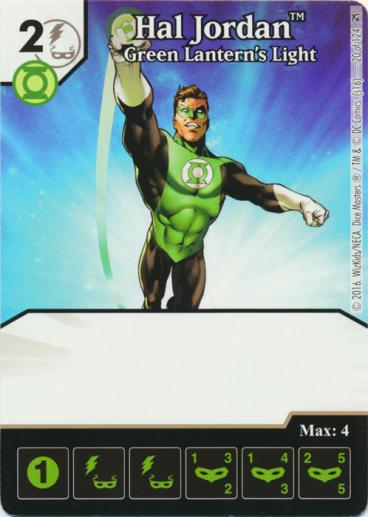 The blank 2-cost crossover Hal Jordan from the GATF set was the next addition, and an obvious choice. Next came the Saint Walker and the Blue Lantern Flash which share the same weakness: neither can attack or block unless I have a Green Lantern active. They were cheap, had decent stats, and their weakness wasn’t going to be a real problem on this team. I decided to round out the team with UC Jade, who lets me Prep a die for each attacking Green Lantern, and Mogo just in case I needed some character dice with beefy stats. While there are ways to remove action dice, they don’t see much use. There are plenty of ways to KO opposing characters that DO see regular use. 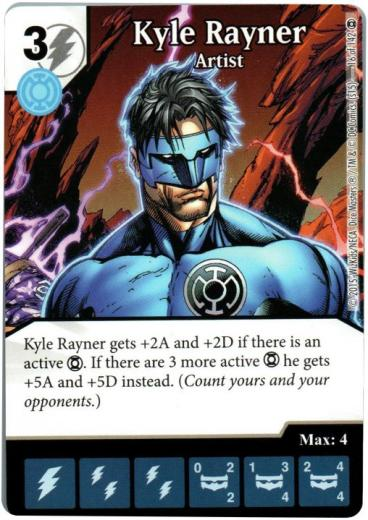 So part of the idea of including Lantern Ring and Lantern Battery in the build was that once I got either of them into the field it would stay there, buffing Kyle Rayner and ensuring any dice from my other two Blue Lantern characters wouldn’t be reduced to spectators. This was a Grey Hunter/Staff of the Forgotten one build from someone who missed the notice, and wasn’t running a single affiliation team. The build also included Tabaxi Rogue which was frustrating, because thinking I wouldn’t have to work around/deal with him (her(?)/it(?)) was part of my thinking when I chose ramp options for my team since nobody plays D&D affiliations other than Monsters. It was a long drawn out game. He built up his wall faster than I built up mine, but things never lined up for him to swing for lethal. I used Under Surveillance with Kyle Rayner once and was ahead on life when time was called and he attacked with everything since he needed to do at least some damage. He wasn’t able to do enough. Another battle of big walls. His was slightly bigger than mine, but the excess was almost entirely Sidekicks. He was running and using the Teamwork Basic Action, but since it only buffs characters who share affiliations, it didn’t affect his Sidekicks. And since only his Sidekicks were likely to get through, a mass attack never looked to be in his best interest. It took until at least the third time around before I was able to get Lantern Ring into my field, but I eventually did manage it. I wasn’t doing much attacking, because I was concerned with how the attacking dice being blocked and KOed would leave me with a weakened field. Eventually, the dice aligned and I was able to deal 19 damage from Lantern Ring when I attacked (2 Hal Jordans, 2 Kyle Rayners and 1 Jade in my field, with 2 masks and 3 bolts in my Reserve Pool). My opponent was at 19, so that gave me the game. Interesting note: on my last turn, I used a Relaxing die. I drew the first die, then checked my bag to see what I might want to name – I had 7 dice in my bag at that point, and every single one was different! The Relaxing die was on double burst so I ended up keeping the Lantern Battery die I drew even though it wasn’t what I named. This was against our group’s youngster. So I decided to ignore Lantern Ring and further handicap myself by restricting myself to buying a Flash and two Saint Walkers on my first two turn. Her team was a mish-mash with her big hitter being common Flash from Justice League, who if the opponent has less than 3 fielded characters is unblockable when attacking alone. She didn’t really have anything else dangerous on her team. If she’d noticed my Under Surveillance basic action dice and tried to finish me off with unblockable Level 1 characters I’d have let her have the win, but she didn’t. I didn’t think to suggest it to her during the game. I was having fun doing things like attacking with multiple GL dice to get the Prep from Jade’s ability. My wall grew bigger and nastier than hers fairly quickly, and I eventually tired of toying with her, and swung with enough for lethal. has amazing synergy with Lantern Ring. It’s a big help being able to deal damage from two energy faces on Sidekick dice instead of just the one. Green Lanterns are an awkward choice for a single affiliation team, at least if you’re going solely by icons – you only have 5 characters to choose from (that’s counting WoL Hal Jordan and GATF Hal Jordan separately, so it’s really only 4) and two non-basic actions. Blue Lanterns themselves are even worse. But stitch them together and they make a decent team. Granted, being able to include Rare Lantern Ring helps – a lot. What are some other affiliations that synergize well with one another? Let us know in the comments.